So you’d like to tackle that bare wall, create more privacy, keep peering neighbours at bay, divide and conquer bleak and barren areas of the garden, resurrect a small outdoor space, refine and define a large outdoor space, lay on a feast and cover for local wildlife, foster a plant that is happy in sun and shade, fast-growing but not a monster, with seasonal fireworks… for all seasons… Draws breath. Sticking a pin in a list of climbers, or grabbing the first one you like the colour of, is probably not the best strategy for choosing your most well-suited trellis candidate. Ideally all the following considerations will form a firm-ish idea of your final selection… fellow planting, sun position, style of garden, shape of supporting structure, adjacent architecture, soil type & drainage, season and even the original sometimes far-flung habitat of the ‘chosen one’. The aromatic allure of cottage garden favourites – roses, honeysuckle, jasmine, sweet peas – is heady. You may love the usual, still special, suspects – let’s throw in clematis while we’re here – but how about a clingy showstopper that’s a little more avant garde and intriguing? Akebia, also known as the chocolate vine because of the flowers’ delicious vanilla scent, is a rewarding, lush scrambler with pretty and unusual flowers. The most popular species are quinata and trifolia but we love the look of harder-to-come-by Akebia longeracemosa with its lengthier, more pendulous and showy racemes. Pinterest is a great place to explore images of this attractive plant. With two plants, a long hot summer and a fair wind you may even see your Akebia bear edible fruit! Search through brilliant Crûg Farm’s plant list if you’re interested in acquiring this rewarding climber. Crûg Farm plant hunters Sue and Bleddyn Wynn-Jones have brought several species back from the Far East. Otherwise known as a climbing blueberry or purple appleberry, Billardiera is an eye catching evergreen shrub that will twine and climb through garden trellis if encouraged. Pale yellow-green, deliciously scented flowers are sometimes purple-tinged and transform into bright violet fruits in Autumn/Winter (UK). Plant in a sheltered spot, partly shaded. You’ll come across this horticultural treasure at many good plant places including Burncoose Nurseries in Cornwall. For vegetable fiends, runner beans will twine beautifully through wirework trellis panels to create a fabulously dense green wall. The colourful flowers are rich pickings for bees and other nectar-foragers. To top that, you can eat the resulting harvest. What more could you want from a climber? If you don’t already know of Somerset-based Pennard Plants’ heritage & heirloom seed collections then you are in for a treat. Behold the runner beans. Now for some top trellis! 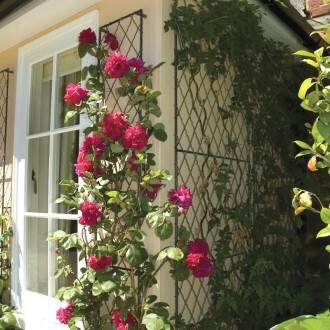 We’re biased of course, always recommending long-lasting, weatherproof metal wirework trellis. Ours is made in our workshop near Bath, zinc galvanised, sometimes painted and more often than not tailored for our customers’ (or your garden design clients’) unique spaces. Wall trellis panels, wall-top trellis, arched screens, porch cover side panels, trellis fencing, gazebos, obelisks and even gates can all be mixed and matched to complement and complete your garden’s overall design. So which climber(s) will you be choosing this year for which garden spaces?